Lately I've been trying to buy fewer yet better quality products. I can’t help thinking how dreadfully wasteful it is to have so many material goods piled high, with expiry dates and seasonal trends making them redundant in little under a year. I want to quit with the easily justifiable purchases purely because they are cheap. I don’t want drawers packed with forgotten make-up, half expired and nowhere near half as used. I don't want full bottles of product sitting on shelves. I don’t want my wardrobe overflowing with clothes that I never wear. I’d rather have less because it means more. I'm a big "less is more" person and tend to have a strict policy that I don't bring things into our house that isn't something we either really love or will use often. It's hard though because I think the mentality in the most of the blogging world is "more is more." 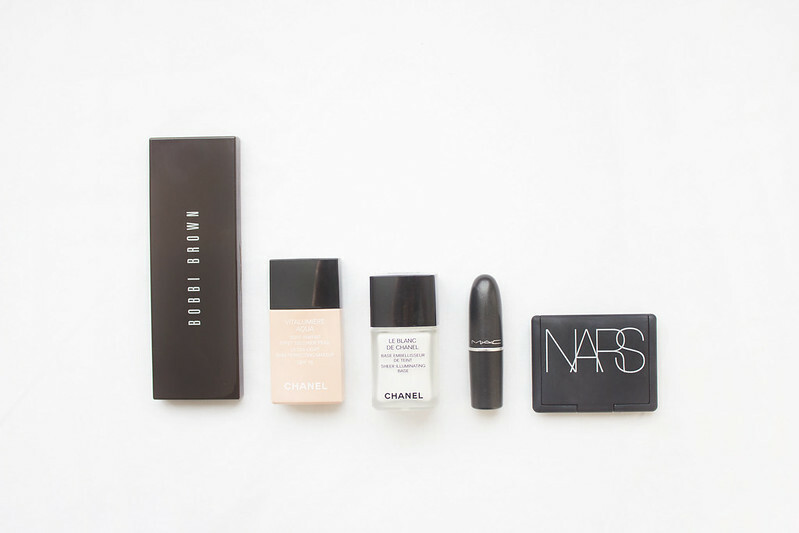 I too find myself trying to make a move towards dramatically reducing my make up, and not just make up, I mean in terms of everything really (plus, I hate clutter). I totally agree, I've found in the past year i've bought way too much stuff that I just don't need/use. I'm trying to take myself off shopping and have taken to browsing instead. I love the Chanel Vitalumiere Aqua foundation, its my new favourite! I need to try and cut down on the amount of products I use too, it will cut down my application time and my skin would look a lot better! I have finally come to this same belief. Already, I only wear makeup probably once every month or two...I never wear it on a daily basis anymore and just looking at my old huge pile of makeup disgust me. Trying to revamp my makeup with only essentials and not anymore than that! I totally agree! I started to cut on my spending this year. I have been asking myself a few questions whenever I purchase things. Will I use it? Do I really need it? If I say yes to all my questions, I will get it. But, sometimes, excitement overcomes my rational thinking and I end up getting new things. I will also ask the same questions after a day and return it to the store if I feel I really don't need it. I was actually just thinking that I needed to go through my make up and get rid of the old products and anything I never use! This came at the perfect time! Now I'm going to go do that! I have been thinking this over the past few days actually. Less IS more, and it'll save you space and money too. "Less is more" is a mantra I keep in mind always, but I still get tempted by offers and just spur-of-the-moment feelings. I'm working hard on doing better when it comes to spending and owning less. I couldn't agree more. I've been thinking a lot in the last couple of months about decluttering my life and being more thoughtful about what I choose to bring into my life. It's so difficult and I've got a long way to go but at least it's a start! YES, I think it's far too easy to simply buy "stuff" because it's cheap. Naturally I really think before making a purchase but I want to start investing in more expensive pieces. Definitely, I loathe clutter and it's so easy to accumulate. I find it easy to justify cheap things when I really don't need them, so I'd rather put more money into better quality items and buy less of them. Oh totally. I'm a really fussy buyer anyway but I want to consciously ditch the easily justifiable purchases. It's easy to end up with too much "stuff." I wear mostly the same shades anyway.. so why do I need five different eye palettes? I think it's OK to buy something just because you want it.. but only if it's the exception to the rule. I definitely ask myself a ton of questions before I buy something, "do I NEED it?" because I can't stand the idea of having things that will expire/go unused, it's so wasteful! YES, DO IT! You'll feel so much better. I cleared out my wardrobe and ruthlessly gave away a lot of clothes I simply do not wear. Also: I think if you weed out the unused/unwanted things you'll find yourself rediscovering favourites in amongst your smaller collection. It makes finding things much easier. "being more thoughtful about what I choose to bring into my life"
THIS! I think it's really important to be picky about what comes and goes in our lives, that goes for people and places along with clothes and make-up. It's such a waste and I think a lot of use take it for granted that we can just buy what we want when we want it.. even if we really don't need it. This is a really great concept. I find myself with a lot of "cheaper" products I forget about instead of good quality products I will use everyday. The same with clothing. I think I might adopt this as a new years resolution this year. AMEN! That's all I can say. The society we live in tells us we need more to be more so give me more more more, I once knew someone who swore by the motto "never wear the same outfit twice", and she lived and breathed it. Why? What's the point? I grew up having a lot less than some of my friends (though I never was poor by any stretch), but having a job and access to my own money meant that I was constantly aspiring for more of this and that, more money, more make-up, more products, more shoes, more clothes. I don't want to spend my life like that! Less is definitely more. I will always be happier with less crap in my life than more because you will always appreciate every single thing, rather than taking it all for granted and having it all sit at the bottom of the draw never to see sunlight.